Sundays are days to catch up from all the stuff you didn’t quit get done last week. Today we clipped coupons and looked though the paper. It’s always fun to save money. I helped by clipping the coupons for stuff I know we use. For example there was a Colgate toothpaste coupon. We will so use this this week at he grocery!!!! We have a folder to put them in a calculator to add it all up and a note pad to make our list. This entry was tagged 365, blogging, coupons, kid friendly, laughing, Mr. 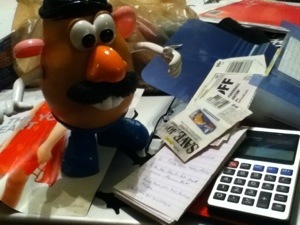 Potato Head, picture a day. Bookmark the permalink.